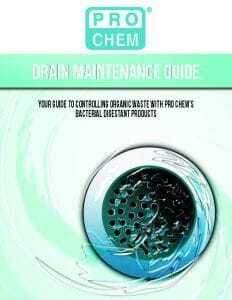 Action | Pro Chem, Inc.
ACTION contains a blend of enzymes and bacteria to rapidly cut through organic waste and open drains. Enzyme accelerators speed up the digesting process, breaking down complex waste molecules into small, simple pieces, so that the bacteria can begin the bioremediation process immediately. Enzyme activity in ACTION includes: alpha amylase (starch degrading), lipase (fat degrading), protease (basic and neutral protein degrading), and cellulase (paper degrading). The bacteria in ACTION are in spore form and are not activated until they reach the organic waste. The bacterial strains present are bacillus laevolacticus, bacillus amyloliquefaciens, bacillus licheniformis, and bacillus pasteurii. 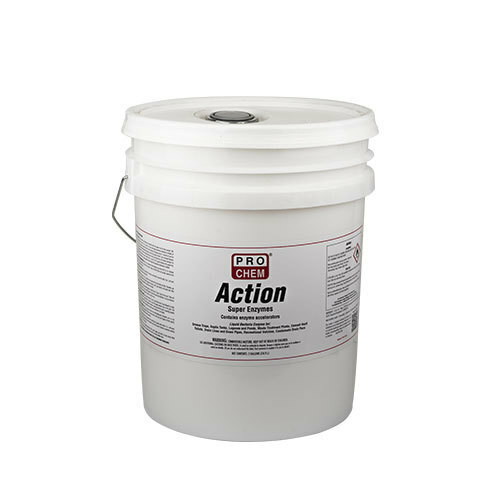 ACTION can also be used to clean and eliminate odors resulting from organic waste. It can be sprayed on carpets or used as a general cleaner in restrooms. ACTION is intended for use to open drains or eliminate waste very quickly, then a preventive maintenance schedule using ALIVE PLUS can be started. GENERAL CLEANING: Dilute 1:10 for general cleaning of floors, walls, toilets and urinals. For odor control, dilute 1:2 with warm water and spray in and around urinals, toilets and other problem areas. CEMENT VAULT TOILETS: Add 1 gallon directly. If necessary, add water to cover the solids. Use 1 pint each week. Make sure the waste surface is kept moist. CARPETS: Test for colorfastness first. To eliminate odors resulting from organic waste, dilute 1:1 with warm water, let soak for at least 30 minutes and rinse thoroughly. May also be used in bonnet or extraction cleaning equipment by adding 1 quart to a rinse tank. WASTE TREATMENT PLANTS: Use 3 ppm for the first 7 days, 2 ppm for the next 7 days followed by a daily preventive maintenance dose of 1 ppm. Add at a point to give the longest detention time in the plant. The collection system can be treated at this same schedule. However, make sure that the plant is operating properly before treating the collection system, or the plant may receive more waste than it can handle. SEPTIC TANKS: Use 1 pint per 25 cubic feet capacity for the initial dose. Pour into toilet and flush. Thereafter, use 8 ounces per week. If the septic tank has become clogged and odorous, add 1 gallon directly to the septic tank. After the tank functions properly, begin preventive maintenance schedule. LAGOONS & PONDS: Use 3 gallon per million gallons of daily flow for 7 days, 2 gallons for the next 7 days and a preventive maintenance dose of 1 gallon per million gallons of daily flow each day thereafter. It may be necessary to increase the application rate if the lagoon or pond has surface crust. RECREATIONAL VEHICLES: Add 2 ounces per gallon of water in the toilet holding tank. Thereafter, use 1 ounce per gallon as needed. Repeat after every cleanout. For use at a dump station, add 1 gallon per 50 gallons of tank capacity followed by 1 pint per week. Repeat after every cleanout. GREASE TRAPS: For best results, start treatment immediately after the grease trap has been pumped. Add directly to the grease trap 1 quart per 25 cubic feet capacity. 24 hours later, begin preventive maintenance schedule: At the close of business, run lukewarm water down each drain leading to the grease trap for 5 seconds to clear the line of any harsh chemicals which will reduce the biological activity in the product. Dilute 1 pint in enough lukewarm water to pour approximately ½ pint of the dilution down each drain. Let mixture stay in the drains overnight. For traps that have been in use where a top crust is visible, add 1 quart per 25 cubic feet capacity directly to the grease trap. Repeat every 3-4 days until the top crust disappears, and then begin the preventive maintenance schedule. Ongoing treatment of all drains and fixtures in your facility is suggested. Below are guidelines on how to treat them effectively.